The Rebel Sweetheart. : Tales from The Fridge. The weather was totally unforgiving today. With the outdoor temperature rising to a staggering 37 degrees Celsius, I might as well be in the flaming tombs of Dante's Inferno. The little man, seeing how irritable I was with the heat, the dust, the perspiration, and everything that has to do with summer, stepped out of the house and sat on one of the chairs in our garden. "Mommy, halika dito! Malamig dito!" (Mommy, come here! It's cool here!) he called out. "Pag dumaan yung Mamang ice cream, ibibili kita," he offered. (I'll buy you ice cream once the ice cream man passes by.) But the ice cream man never came. Perhaps he chose not to brave the scorching sun. Not wanting to let my son's big little heart down, we made a quick trip to the nearest supermarket just to score this. My new favorite ice cream, next to Reese's Peanut Butter Cups. Anything with caramel, I love. Yue, on the other hand, likes this because it's named Bumble Bee. Oh, those heavenly swirls of caramel! There are no words to describe how delectable this treat is! Yue and I could have finished the entire tub in one sitting if we wanted to. But we saved some for tomorrow, lest the temperature goes up to 38 degrees. If that happens, the little man and I will just spend the entire day at the mall. Free airconditioning, no extra charge on my electric bill. Haha! it was indeed extremely hot today..well, not only today but the past few days as well! grabe, sobra talaga! perfect na perfect ung ice cream sa panahon ngayon! Not quite that warm here yet, but it's starting to feel like spring! You made me eager for it to come! Wow!! Im craving for ice cream now coz its so hot! by the way, we live near Tagaytay that is why we frequently visit the place. Nothing like pure caramel love on a hot summer day! 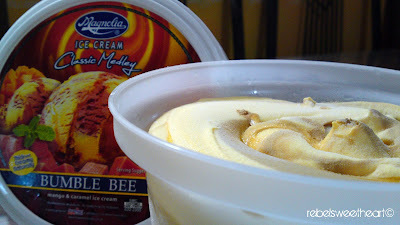 yeah, very thoughtful son... and look what he got as a reward hahaha... miss Magnolia ice cream! Hope you stay cool! Ice cream looks super yummy! Aw, you're little boy is a doll! Your charming and sweet little boy really knows how to make Mommy happy, and that Bumble Bee ice cream looks enticing, perfect for hot summer days! makes me wanna go to the nearest mall and grab a cup of ice cream now..kaso tulog pa si bagets ko eh, perhaps when he wakes up! visiting you from MM!hope you could check back the the new ME! You're right...the weather has just been really cruel these days. That accounts for my constant headaches, I guess. Bumblebee? Wow, I've never heard of that flavor. I'm sure my daughter would love that too. your son is very thoughtful, sobrang init talaga ngaun. oh so yummy! enjoy warm weather lil guy :) visiting from Hapiness is.... hope you could visit back. Those ice cream are sweet delights when it is excruciating hot outside Sis :-) Visiting late from last week's Yummy Sunday, hope that you can return the visit too.